‘Corduroy Part 2’ is the second part of an international exchange exhibition featuring selected artists from Studio 44 (Stockholm, SWEDEN) and neo:artists (Greater Manchester, UK). The first exhibition in Stockholm in October 2017 showcased artworks and works in progress, alongside sketchbooks and digital documentation. The fully developed final group show is now exhibiting in Bolton, Manchester from October 2018. 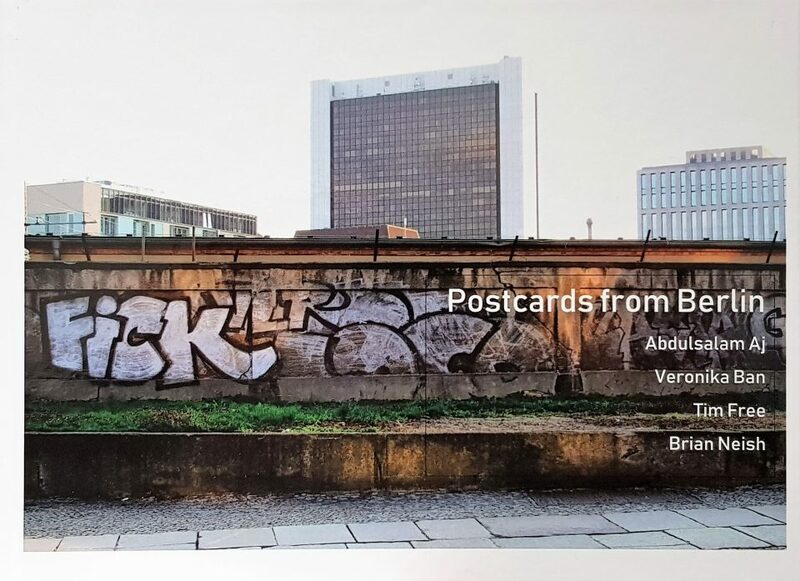 These two groups of artists from artist run spaces, based in Stockholm and Greater Manchester, have over the past 26 months been engaged in various forms of dialogue, collaboration and parallel directions in research. They have been considering how as artists and European citizens, we interact with our physical environment and the effect this has on the larger world, physically and metaphysically, especially after this past tumultuous year in politics. ‘Corduroy’, a project in two parts, reveals how the artists from both countries have grappled with these ideas. 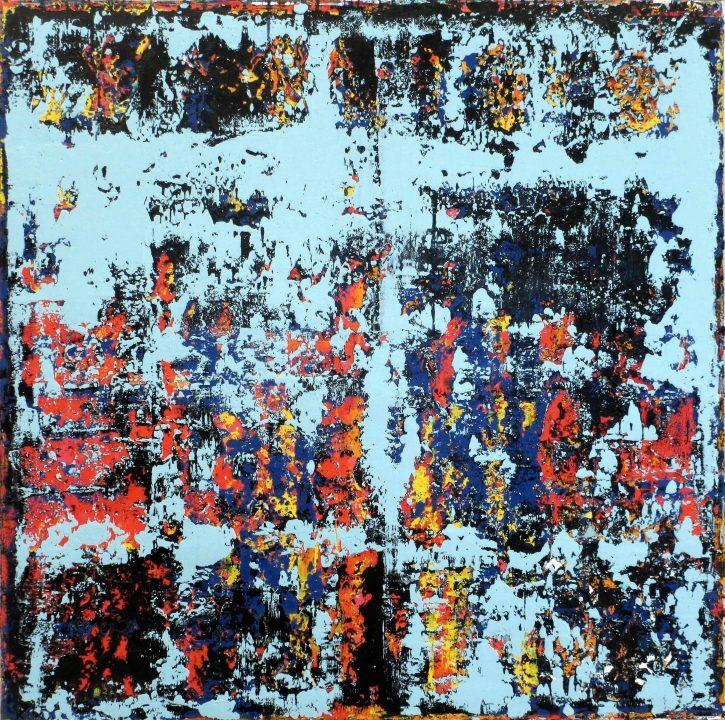 They have employed a diverse range of processes, techniques and materials, considering our past, present and future through historic art practices such as oil painting, drawing, printmaking and embroidery to modern day video, digital photography, spoken word poetry and found art objects. The name of the project was called ‘Cordurory’ to play to the joke about ‘Manchester’ being a kind of material in Sweden, that in the UK we call corduroy. It gave a production and industrial element to the title. Brian Neish (neo:artists, Greater Manchester) and Helena Norell (Studio 44, Stockholm) collaborated for ‘Corduroy’ due to their joint interest in painting, abstraction and feelings associated with the passing of Time. They decided to keep the working process simple and to adopt a few rules to bind them together, and to ensure the subsequent pieces had elements in common. Helena was inspired by the punch cards from Almgrens silk factory in Stockholm where they ring over the looms. Each punch card represents a row in the fabric. Following on from this, Brian suggested working on pieces that would be at the same size ratio as the original punch cards (1:5) and that these pieces would incorporate circles in some way to reflect the essence of the cards. 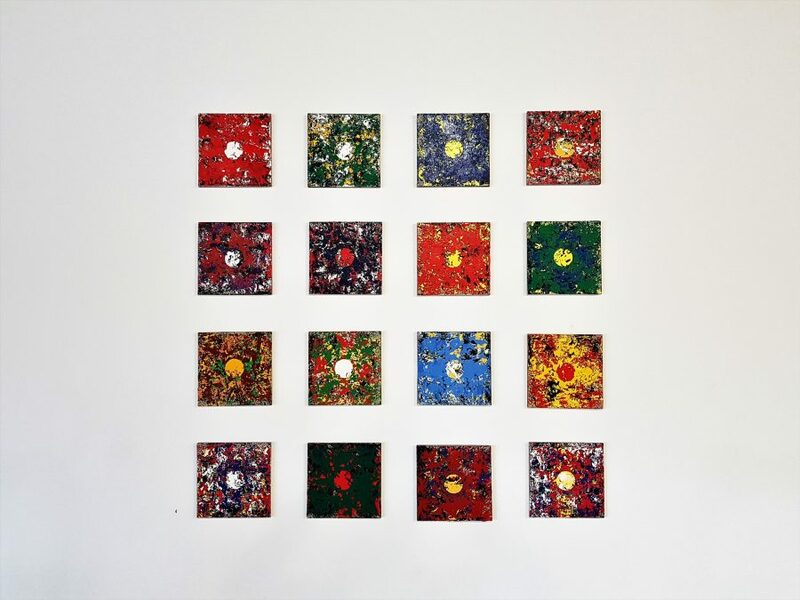 Brian’s final piece for the Bolton show is titled ‘United Colours of Exploitation’ and consists of sixteen 20 x 20 cm painted panels, each one multi-layered with the colours of a national flag called out by the UN, and other NGOs, for exploiting their textiles factory workers in some fashion. The viewer is invited to figure out the sources of the exploitation from what they can see, and infer from existing knowledge of national flags. It also means we might speculate that our own nation’s flag might be represented, and in turn question whether we are somehow complicit in this exploitation because we buy clothes originating from those countries. 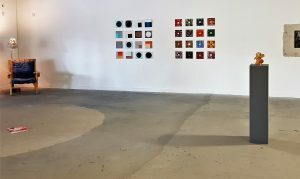 The work is a development from ‘Kort’, shown in Stockholm at Corduroy Part 1 that used circle elements and layered colour to express something about the idea of time passing and obsolescence. The wider exhibition also features the artists that showed in Stockhom and a deeper development of ideas and concepts from that iteration. ‘CORDUROY PART 2 – ALMOST NOTHING, BUT SOMETHING’ WILL BE OPEN TO THE PUBLIC AT NEO GALLERY 23, 4th OCTOBER – 11th NOVEMBER 2018. Participating artists are Alyson J Barton, Sandra Bouguerch, Mariana Ekner, Louise Garman, Emma Goransson, Christina Gothesson, Bethan Hamilton, Maggie Hargreaves, Suzanne Harulow, Susanne Hogdahl Holm, Geraldine Hudson, Thaleia Kavvada, Brian Neish, Sebastian Nordbeck, Helena Norell, Angela O’Mara, Steph Shipley, Jason Simpson, Nina Wedberg Thulin and Denis Whiteside.